era 1 wins the 2018 MIPA Award for Best Acoustic Amplifier! 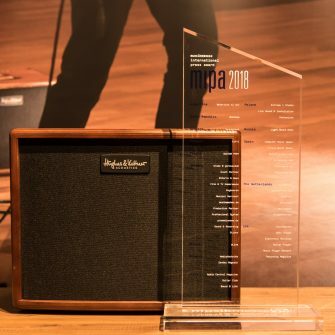 Great news: era 1 just won the prestigious Best Acoustic Amplifier prize at the 2018 MIPA Awards ceremony in Frankfurt, Germany! The MIPA (musikmesse International Press Award) event is held each year during the musikmesse show in Frankfurt. The prizes are voted for by a panel of international journalists from around 50 magazines in 15 different countries. era 1 was able to beat off strong competition in a thriving sector of the MI industry to take home the award. Designed, engineered and made Germany in cooperation with renowned acoustic figurehead Michael Eisenmann, the 250-watt amp’s peerless acoustic sound reproduction and its multitude of practical features for active musicians clearly resonated with the international MIPA jury. This is the second Hughes & Kettner MIPA success in the past three years by the way! The mammoth TriAmp Mark 3 electric guitar amp was named Best Guitar Amplifier at the 2015 ceremony. Now check out era 1 here and see what all the fuss is about!